Red Sox Pregame Notes 8-18-14 Jackie Bradley down, Mookie Betts up. Boston, MA- As soon as the Red Sox continue to show some signs of life in the American League, they then lay an egg to show their fans and the MLB that they are just not a very good team in 2014. 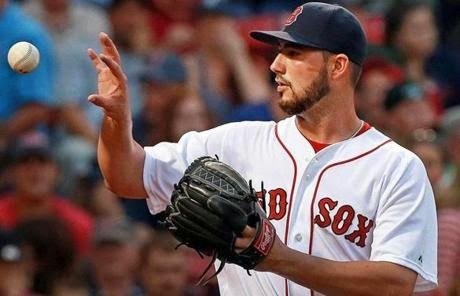 Last night's pounding to the lowly Astros proved once again that the Red Sox will need good defense, pitching AND timely hitting in 2015 in order to win the AL East. With only a month or so left in the season, the front office continues to tinker with the team to see which pieces they should keep and which they can trade. Today's move involves a Gold Glove caliber center fielder getting pushed down in favor of an up and comer who can hit. Jackie Bradley will get some time at AAA Pawtucket and Mookie Betts will get another chance to help out the Red Sox. In tonight's 7:10pm game versus the Angels, the first of four at home for the Red Sox, they send another rookie to the mound to face the up and down C.J. Wilson. After throwing five winless games in a row, he finally got the win versus the Phillies in Anaheim in his last start. Brandon Workman is still looking for his second win of the season and he stands at 1-6 with a 4.45 ERA. Like Wilson, he is going through a rough patch as he has six losses in his last six appearances. It is his first start in 11 days. Dustin Pedroia and Yoenis Cespedes have hit Wilson well in their careers. They are hitting .429 and .400 respectively in over 20 at bats against the southpaw. It was revealed that Dustin Pedroia did not play in yesterday's loss to the Astros because of flu-like symptoms. Hope that doesn't get around to the rest of the team. When the Angels have played Boston this season, they plate a lot of men. In fact, Anaheim has scored five or more runs in seven of their last eight games against the Red Sox. The streaky Josh Hamilton is cold again, hitting just .189 this August. He was "awarded" yesterday off for The Angels. Boston has challenged 24 plays this year. 12 have been overturned.